Cairns has a huge choice of accommodation, from budget backpackers hostels and B&Bs to camping, hotels and upmarket resorts. In the low season from early January till Easter you can often find great standby rates, giving you luxury accommodation for the price of budget accommodation. Although the Cairns Esplanade is on the waterfront it has no real beach, so unfortunately there is no beachfront accommodation right in the city, but the Cairns Lagoon makes a good substitute for a beach with it large pool and grassed areas for sunbathing and ball games. Palm Cove is a northern suburb of Cairns which is a very popular place with beach lovers as it has many resorts either on the beach or near the beach, although not a lot of budget accommodation choices in this area. Backpackers and other travellers looking for budget accommodation will be pleased to hear that no less than three Cairns backpackers hostels were in the top three of best rated hostels in Oceania which includes Australia, New Zealand and the Pacific, by Hostelbookers.com . This shows you what a great range of quality of budget accommodation there is in Cairns! Save time and money when you book your accommodation in Cairns with Wotif.com. This Australian accommodation website has an international reputation for having the biggest choice in the best deals on accommodation from hotels to holiday homes, and cheap flights as well. Simply click the banner and in seconds Wotif will show you what accommodation is available in Cairns and at what price, and with helpful customer reviews as well to help you make the right choice, as you don't want just cheap accommodation, you want good value accommodation! Cairns has a huge choice in backpackers hostels and they are all over town. Some of the more homely and quiet hostels are found on the inland side of the railway station / Cairns Central shopping centre. In the dorms of hostels closest to the night clubs it might be harder to get a good night sleep as by the time the last one in the dorm comes home from the nightclub the first one is getting up for their reef trip again. HostelBookers has budget hostels, motels, hotels, B&Bs and apartments in Cairns. What's the quickest and easiest way to find budget accommodation in Cairns? You can of course Google for budget accommodation but you spend a long time surfing through different websites, which are all designed differently and often for good looks, and it can take considerable time to find out the practical basic information of what the room prices are, what the facilities are, what the location is, and what previous customers thought of the place. Whenever we travel anywhere we use a comparison website that shows you all the choices available, together with prices, location maps, and guest reviews, laid out right next to eachother, so it is easy to compare and make a choice. A great one we would like to introduce to you is Hostelbookers.com. DON'T THINK THEY ONLY HAVE HOSTELS ! Especially in the bigger cities they have everything from B&B to hotels to motels. The search features on the site make finding your ideal budget accommodation a breeze, after choosing your city and dates you will be presented with a page like below, and then you can refine your search by using a slider to set your price, and choose from accommodation types such as hostels, motels, hotels, apartments and even campsites! Hostelbookers charges no extra booking fees, all you pay at the time of booking is a 10% deposit and the balance on arrival. They also guarantee that they are the cheapest, or they will refund double the difference! Give them a try and you'll be impressed! Australia, New Zealand, Pacific region that received the highest overall customer rating in 2010 ! And Cairns hostels Castaways and Globetrotters International were in the top three for best overall value! Dreamtime Travellers Rest won the award for best atmosphere in the whole region. Choose your city and book your bed in minutes with Hostelbookers.com ! No extra booking fees! Travellers Oasis Cairns Backpackers is a charming little guest house offering cosy and clean facilities to a budget conscious travellers, in a friendly and relaxed environment. Centrally located in a quiet safe area, our guests can relax in our sparkling pool, with hammocks and chill out to the music . We supply all linen, towels, plus free tea and coffee. We also have an in house Tour and Information desk, offering great local advice on the standbys and special prices. Tropic Days Cairns Backpackers is run by the same award winners as the above hostel, two fabulous fully restored Queenslanders, established by two travellers, Kathy and Gabriel Thallon and their three young girls Annie, Molly and Poppy. Having travelled around the world for years ourselves, we totally understand the important needs of being a traveller. So with comfort in mind, we at Tropic Days Cairns Backpackers offer various backpacker accommodation options such as: Singles, doubles, twins and 3/4 bed dorms, all with linen and towels, plus unlimited tea and coffee. Tropic Days is set in a beautiful landscaped tropical garden with a sparkling huge pool, chilled out music and plenty of hammocks in a grassy green lawn to sunbathe and relax. Billabong Bed and Breakfast , Cairns - A Birdwatchers Paradise, a unique 5 acre property in a very natural setting with huge melaleuca (paperbark) trees surrounding the 2 acre Billabong. Quality appointed suites with private deck overlooking the Billabong. 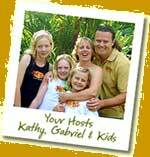 Kooka's Bed & Breakfast , Cairns - Kookas Bed & Breakfast, nestled in tropical rainforest of Far North Queensland on the foot of Mount Whitfield in Edge Hill it is the best spot for your relaxing holiday in Cairns. 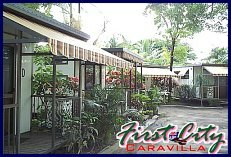 First City Caravilla - Browse availability and book online here. Skinny Dips Resort and Spa offers a range of affordable massage and pamper treatments designed for guys. Enjoy our "Sunday Tea Dance & Fresh Meat"
Cairns Holiday House - budget holiday home and short term rental located in Yorkeys Knob Beach, one of the most beautiful Cairns' Northern Beaches. Click here for a selection of holiday houses in Cairns and the region. Use Agoda to find all the best discounted rates on hotels in Cairns. We currently have no specific nudist accommodation places in Cairns listed yet.